Movistar adalah perusahaan raksasa yang bergerak dibidang telekomunikasi yang berbasis diSpanyol. Perusahaan ini sebenarnya sudah lama terjun mensponsori tim-tim balap Motogp. Dari Suzuki Movistar, Movistar Honda dan yang terbaru mensponsori Tim yamaha Factory, dengan nama Movistar Yamaha Motogp tim. Rival utamah Movistar dalam mensponsori tim balap adalah Repsol, perusahaan raksasa oli dari Spanyol. Movistar dan Repsol dulu pernah “berseteru” memperebutkan dani Pedrosa. Nah.. Motogp Lemans Perancis kemarin tentu Movistar sangat senang sekali, kedua rider yang disponsorinya berhasil menapaki podium satu dan dua. 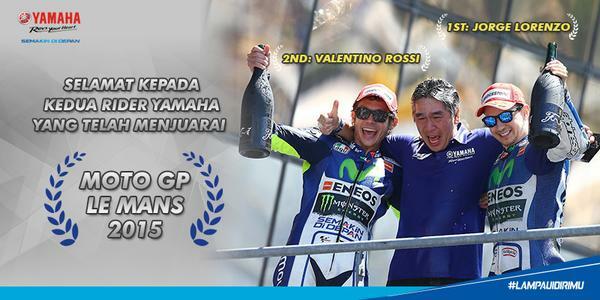 Yups..tag line semakin didepan yang berasal dari yamaha Indonesia tentu sangat senang, dengan kedua ridernya menapaki podium plus rider yang “ditempeli” tag line dari kompetitor yamaha Indonesia gagal podium. 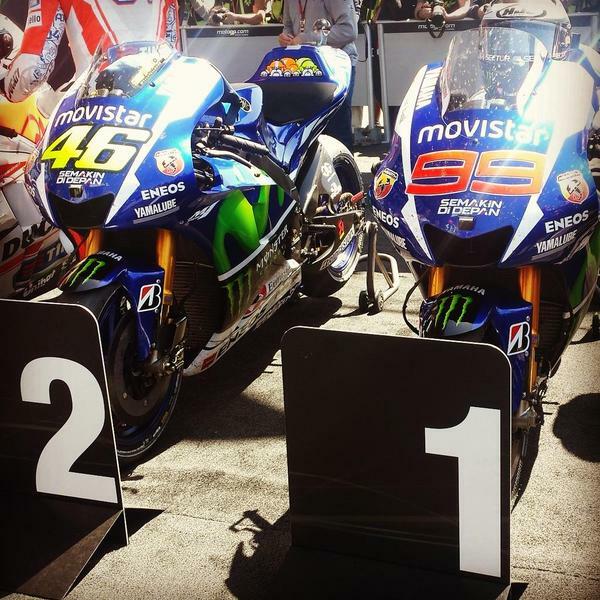 he..he.. itulah tiga sponsor yang ikutan berpesta saat Jorge Lorenzo dan valentino Rossi berhasil naik podium satu dan dua digelaran Motogp Le mans Perancis 2015. Monster Energy has agreed to a two-year partnership deal with Yamaha Factory Racing, which will see the Monster brand act as sponsor to Yamaha’s MotoGP team. The announcement had been widely anticipated, and reported on here prior to Christmas, and extends Monster’s participation in MotoGP, where they go head-to-head with the other energy drink giant, Red Bull. Though the deal between Yamaha and Monster will provide a useful influx of cash for the Japanese factory team (Spanish website Motocuatro.com put the total sponsorship deal at 4 million euros) Monster will not become title sponsor. Instead, the Monster logos will receive the same kind of prominence as Japanese oil sponsor ENEOS, appearing on the fairings of both bikes, as well as on the leathers of both Jorge Lorenzo and Valentino Rossi. The addition of Monster created a problem for Yamaha’s management. Jorge Lorenzo had just extended his personal sponsorship deal with rival energy drink Rockstar for two years, a contract reportedly worth a million euros a year to the 2012 World Champion. 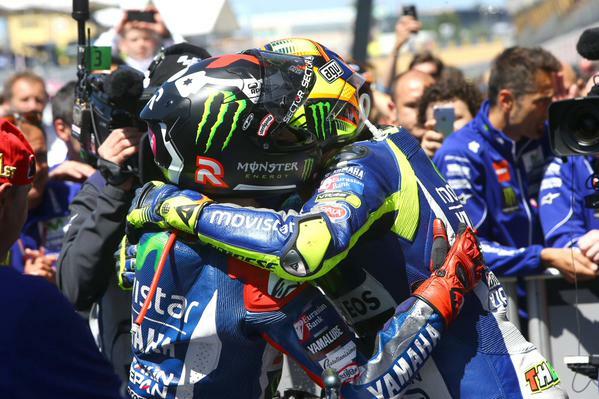 Thus, Yamaha were forced to exercise a clause to buy out Lorenzo’s Rockstar sponsorship from the Spaniard. Accordingly, Monster upped their offer to Yamaha to cover both the cost of sponsoring both riders, and to cover the cost of Lorenzo’s lost Rockstar deal. The Monster deal leaves two previous deals unaffected, however. The deal with the factory squad leaves the agreement Monster has with Yamaha’s satellite team Tech 3 untouched. That team, consisting of Cal Crutchlow and Bradley Smith, will continue to sport Monster title sponsorship, and be known as the Monster Yamaha Tech 3 racing team. Valentino Rossi’s personal sponsorship deal with Monster is also unaffected, something which the Yamaha press release is at pains to make clear, possibly to counter earlier reports that Rossi had been asked to bring a sponsor to pay for his return to the Japanese factory. Though the deals are separate, this is in effect is what has happened, with the €4 million Yamaha is receiving from Monster reportedly equivalent to the amount Yamaha are paying Rossi to ride for them. Though Yamaha remains without a title sponsor, the amount generated by the ENEOS and Monster deals (around 8 million euros in total) is already more than the deal the factory had with Fiat when the Italian car maker was title sponsor to the team. A title sponsor would surely be welcome, but this deal makes Yamaha’s future in MotoGP a little more secure.